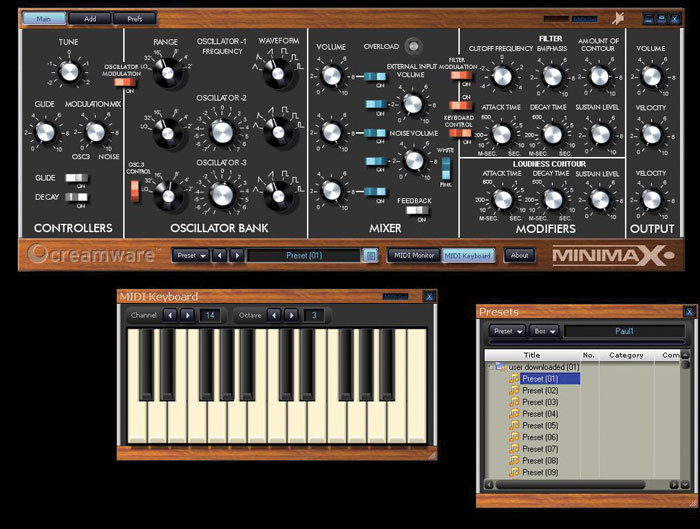 Creamware's Minimax is certainly not the first digital emulation of a Minimoog to be released — nor even Creamware's first. But it bucks the recent trend for software recreations of vintage synths — by being hardware! Can it replace the real deal? What can you write about the Minimoog that hasn't been written a hundred times before? Well for a start, that it now has a hardware-based DSP-driven dopplegänger. Awaiting attention in my studio today is a small, wood-framed desktop module with a naggingly familiar layout. Creamware's Minimax ASB ('Authentic Sound Box') is a digital reincarnation of the '70s monosynth, and loses the keyboard and left-hand controllers, but gains MIDI capabilities, memories, effects and even polyphony, while retaining many quirks of the original design — so there's no dedicated LFO, and no oscillator sync or pulse-width modulation, as found on some modified Minis. All this comes at a price considerably less than that of a second-hand Minimoog — and I should know, as I sold mine a few years ago. If Creamware have nailed the sound, this module could find itself in great demand. And the company have been modelling the Mini for years, with the Miniscope and Minimax plug-ins for their Pulsar and SCOPE systems and later for their Noah hardware synth, so you'd expect the Minimax to be a highly evolved emulation. As you can see above, the Minimax's panel closely resembles that of the Minimoog, with sections labelled Controllers, Oscillator Bank, Mixer and Modifiers, although there's no headphone socket nor a A440 tone generator (the latter, at least, we shouldn't miss, thanks to digital stability). In use, the knobs are smooth, responsive and feel right. The minimal visible additions include two knobs that add velocity control over both envelope amounts, plus a Feedback switch to route the synth's output back through the filter section, permitting Minimoog-style overdrive. Underneath the main panel is the Configuration Strip, where more modern features are accessed. Here you assign the MIDI channel and access the effects, patch memories, and polyphonic mode. There's also a button that transforms the data-entry knob into a master volume. You'll note there is already a dedicated volume knob on the panel, but this is a separate, programmable parameter stored with each patch. The three-character LED display is basic but adequate (although there's no MIDI indicator LED), and all the lower selector buttons are of the LED-bearing, positive-clicking sort. The rear panel is very different to that of a real Mini — there are no voltage inputs, S-Trig connectors, or scaling pots for each oscillator (tweaking these was a regular hassle on my old Minimoog). The Minimax has MIDI In, Out and Thru, plus a USB socket. Don't be misled by the Minimax's twin audio inputs and outputs. The Minimoog had a completely monaural signal path, and so does the Minimax. Its oscillators, noise and any external signals pass through a single low-pass filter, so the two audio inputs are summed to mono internally, and the two outputs are only stereo in the sense that twin delay lines are hardwired to the right and left outputs. Finally, the power supply is external. I know these keep costs down, but as a live player, I hate them and as long as companies keep using them, I'll keep complaining! The original Minimoog used single triggering with low-note priority, meaning that envelopes were not retriggered when you played legato. This gave rise to fluid solo playing styles, but could occasionally be a nuisance when you required articulation that was both fast and precise. The Minimax solves this dilemma by enabling single triggering as its default, but you can specify multiple triggering and last-note priority with the aid of the Remote editing software or via MIDI control changes. High-note priority is not available, though. The Minimoog, of course, had no dedicated LFO, although you could create the effect of one by setting Oscillator 3 to a 'Lo' setting. The Minimax works the same way, and equally faithfully, Creamware have varied one of oscillator 3's waveforms, replacing the mixed triangle/sawtooth with a reverse sawtooth (although this isn't shown on the front panel). The reverse sawtooth doesn't sound any different from the forward version, but it offers another, distinctive modulation source. A Modulation Mix knob fades smoothly between oscillator 3 and noise (white or pink) and switches determine the routing of these sources to the oscillators and filter, modulation amount being set by your MIDI controller's mod wheel. Ah, simplicity! Having had a quick look round, I was eager to make some noise. Predictably, I played my first note then reached straight for the Cutoff knob to be rewarded by a smooth, Moog-like sweep. The Resonance (or Emphasis, to use Minimoog terminology) sounded more realistic than the average modelled filter; it was possibly a fraction loud and shrill at its higher settings, but was definitely up there with the best of them, and self-oscillated nicely when cranked up to maximum. And when I lowered the cutoff and applied some pink noise modulation, I was impressed to hear the filter bubbling and warbling in a convincingly Minimoog-like way. As on the Minimoog's rear panel, there are audio outputs and inputs, but then come the modern additions — the traditional five-pin trio and USB connectors for MIDI.Photo: Mark EwingChecking out the oscillators, I found the waveforms suitably authentic to the ear, from rich brassy sawtooth through to reedy pulse wave. When detuned, they exhibit the nice 'swimminess' of Minimoog oscillators, and authentically, they never quite lock together. I found the basic tones to be fairly bright, so I'm guessing Creamware modelled one of the later Minimoogs. At high pitches, the waveforms are clean and free of artifacts, whilst lower down, there's a fullness sometimes lacking on virtual analogues. After finding the filter and resonance knobs completely smooth in operation, I was surprised to hear stepping on the oscillator frequency and patch volume controls, but most noticeably on the Amount Of Contour knob in the Filter section. Unsettled, I turned to the envelopes — and instantly realised something was wrong. The manual claims that these are 'modelled on the Original's behaviour', but they're not. Certainly, as on the Minimoog, the Minimax's envelopes only have three stages, with a switch determining whether release is off or is shared with the decay time. But if you play a note with a long decay/release, and then shorten the time, instead of changing instantly, as on a Minimoog, the note still continues to its original length on the Minimax, the change only becoming apparent when you retrigger the note. All the envelope stages behave in the same way. Apart from this, I found the envelopes to be reassuringly snappy, capable of delivering the punchy basses and percussive sequences we all know and love. There were a couple more noteworthy niggles. Despite sending loud signals to the audio inputs, I was unable to activate the yellow overload LED, and became convinced I had a unit with a hardware fault. Not so, Creamware assured me: this LED isn't yet enabled in software. Finally, I found that the Glide time was stepped, functioning more like glissando than the Minimoog's smooth portamento. When I reported this, Creamware claimed there was already a fix, and so there was — although it wasn't yet available from their web site! This process introduced me to Creamware's idiosyncratic way of dealing with OS updates (see the box overleaf). A CD in the Minimax box contains the Remote software, which offers a visual display and editing environment for your patches, as well as giving complete access to all effects parameters and acting as a librarian and OS updater. Currently it is available for Windows XP only, although a Mac version is in beta testing. If the driver install was painless, my initial efforts to run the editor were anything but; on my studio PC, the installer program crashed every time. Eventually, Creamware had to send me a version that didn't require installation — I just copied it into a directory and it worked. The editor has a clear, intuitive user interface divided into two halves: synth and effects. The synth graphic even has all the oscillator waveforms labelled correctly, unlike on the front panel! As you already have a knobby interface on the synth itself, I expect the main use for this program will be to tweak effects parameters and to store patches. You can even use it to wipe the Preset patch bank, and replace it with your own. Remote is also used to add OS upgrades. Unfortunately, you have to use this software to upgrade your OS, so if you have a Mac or don't have access to a recent PC, you may wish to delay your purchase until the OS is perfected. The OS update process is, frankly, more complex than is necessary. First you get the software running; this extracts the serial number from the Minimax. You then email this number to Creamware Support, and wait. When they email you back, it is (in theory, at least) with an activation code and with the OS itself, ready to be loaded into the software. This process leaves users of older computers and hardware sequencers out in the cold — why can't we just download a SysEx file from a web site and load it over MIDI in the usual way? 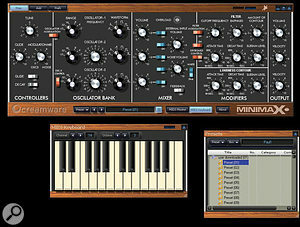 Of course, the original Minimoog had no memories, but the Minimax offers 128 preset and 128 user patches. When selecting user patches, the Preset LED initially remains lit. To see the value of any control, you push the Preset button until its LED goes out, and then, when you turn a knob, the small row of yellow LEDs in the Match display at the bottom left indicates how far away you are from the stored value. When the middle LED lights, you're close, and when it flashes, you're there. LEDs to the right and left show you're moving away from the stored value. Values can be fine-tuned with the Up/Down buttons to the right of the display, or the data knob to the left. To return to patch selection mode, you hit the Preset button again. If this method doesn't appeal, you can hold down the User button for a couple of seconds. All the front-panel controls then become 'live' — my preferred method of working. I think programming a synth like this is more of a personal experience than, say, extracting pianos and violins from a modern workstation. Certainly the factory patches, mostly typical analogue sounds of the late '70s or early '80s, didn't do much for me, but there were sufficient polysynths, organs, leads and basses to serve as starting points. Soon, I had assembled a selection of warm, glide-based solo sounds, sweeping basses, subtle brass and all manner of thick, fluid, resonant leads. The Minimax handled like the most stable, flawless Minimoog I've ever played: there were no glitches or instabilities whatsoever. I particularly liked the filter overdrive; this is activated by switching on Feedback in the Mixer section, setting the external input to 'on' and cranking up its level. The result is a very creditable impersonation of the famous Minimoog trick of feeding the headphone output to its own audio input. Holding down the Up and Down value buttons together activates the Minimax's polyphonic mode, with the display showing 'on' when active and 'of' (!) when mono operation is restored. Curiously, though the manual claims that it is six-note polyphonic, the Minimax can play 12 notes at once, although there is no attempt at offering multitimbrality. Polyphony requires that you approach the Minimax differently — patches created to sound fat and raspy in mono mode will sound excessive when you play chords, using the Feedback button to overdrive the signal gives pretty rough results, and at high volumes, nasty distortion results. Programming 'thinner' patches with subtle oscillator detune proved most effective, and I discovered a wealth of useable organs and strings, plus some stunning synth brass. Although I missed having pulse-width modulation, I thought the Minimax performed beautifully as a polysynth, with a presence and depth that few digital analogues can offer. However, voice stealing can occur unexpectedly when playing two-handed, since each voice appears to be allocated in the order it's played. This means that notes are preserved until released, regardless of new notes that may be played. This can be a good thing: if you program a patch with a long decay/release, you can hold a left-handed chord and then solo non-legato with your right, retriggering the same voice cleanly with each note, rather than creating a solo 'mush'. I rather liked this implementation, although Creamware tell me that polyphonic voice allocation is something they intend to return to in a future OS update. The Minimax's MIDI implementation is extensive. Elsewhere in this review, I've noted the velocity control of filter and amplifier envelopes, with dedicated Amount knobs for each. This feature adds a sense of dynamics that's taken for granted on modern synths, but which can breathe fresh life into analogue timbres. In addition, there are several parameters that are not accessible via the ASB hardware. Of these, mod wheel depth and offset are probably the most valuable, since they can be employed to create patches with constant modulation effects. Aftertouch can be routed to filter cutoff, output level or to oscillator pitch, but, sadly, it can't be used to control modulation depth. Pitch-bend range is also programmable per patch. The best news is that every Minimax parameter has a MIDI Continuous Controller assigned to it — even those for which there are no physical controls. You can activate polyphonic mode, set every effect parameter, or change the envelope triggering response, all using simple MIDI CCs. As you'd hope, the knobs all transmit these, and there's even a dedicated Local Off switch to let you do so without altering the sound engine. This is great if you like controlling everything over MIDI from your sequencer. The onboard effects are basic but well judged, consisting of just a chorus/flanger and a two-channel delay line. The chorus/flanger allows control over feedback, phase, rate, depth and the wet/dry mix. In flange mode, with feedback set quite high, you get a welcome metallic bite that slices through a mix nicely, and the chorus fleshes out polyphonic string sections nicely. I've always felt that delay is the most valuable effect on analogue synths, so full marks to Creamware for putting not one but two on board. The maximum time available is about 1.5 seconds, and you are always required to set left and right delay times individually. There's no option to sync the effects to MIDI Clock, although you can independently set a tempo from 72 to 199bpm for each delay channel, and you can set the delay clock from 1/64th notes to single notes (including triplets). The manual fails to mention the 'Cross' feature, which alternates the feedback signals from one channel to the other, producing a pleasant stereo-widening effect. Finally, you can bypass the effects altogether with a dedicated switch — and once engaged, the bypass remains on when you select new patches. There are five preset effect algorithms (referred to numerically due to display limitations), and you can only set the wet/dry mix and the three most important parameters for that preset. For example, you might be able to adjust left and right delay times and damping, but not feedback. However, this didn't bother me too much; I spent five minutes setting up a few knobs on my Novation Remote 25 to perform the full range of adjustments via MIDI CCs, including the effects bypass, and never gave it another thought! My initial impressions of the Minimax were less than positive. 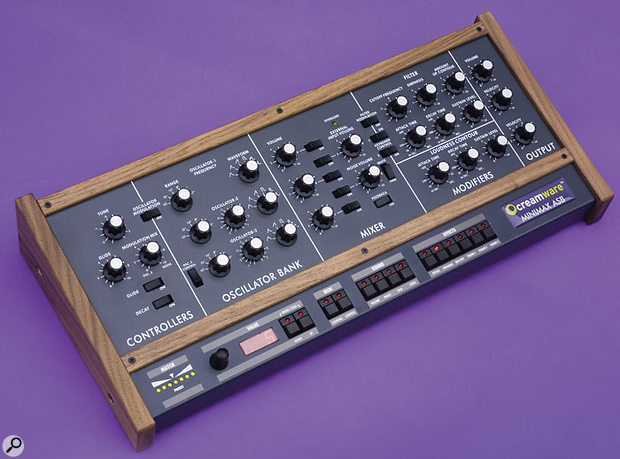 Given Creamware's past attempts at modelling the Moog sound, I was surprised to hear audible stepping on some controls, not to mention envelopes that didn't perform like a Minimoog's, and the non-operational overload LED. But as I started to play and program the Minimax, that impression changed. I was able to obtain sounds that closely matched my favourite old Mini patches, and whilst the Minimax sounds didn't have the instabilities you would find on a Minimoog (and therefore some of the magical nuances), I was happy to live with that, and welcomed the addition of velocity control, effects and polyphony. I should also mention that Creamware took on board all the points I raised, and promised to revisit the operation of the envelopes, to add smoothing to more of the controls, and to activate the overdrive LED, although these fixes had not yet been implemented when I submitted this review. I accept that the Minimax ASB will never compete side by side with a real Minimoog in terms of physical presence, and cannot offer the quirks and personality traits that come from an ageing set of analogue electronics. But the longer you work with the Minimax, the less these things seem to matter, and the more you come to value the convenience of a reliable, drift-free module that won't develop crackly pots or a duff keyboard. This was brought home to me when I asked a friend to bring his 1970 Minimoog around to put it alongside the Minimax. Significantly, he decided it was too fragile to risk the journey. The Minimax could be a perfect MIDI-capable solution for those who want to gig with their Mini, but dare not. Alternatively, if you've always wanted a Minimoog, but would prefer one in a reliable, affordable, hardware form, the Minimax could be what you've been waiting for. Exceeds the capabilities of the original Mini, offering memories, polyphony and effects. Software needs a bit of a polish. For me, the Minimax is a more-than-adequate substitute for a real Mini — especially live. The MIDI implementation is a delight and the addition of effects and polyphony a real bonus. A few tweaks to the software will make it better still, but even as it is, the Minimax is reasonably priced and really rather tempting.